Gold bars are available in an attractive array of options with each passing year. Mints and refineries around the world offer investors and collectors alike with various choices when buying gold bars online, which include minted ingots and massive cast gold bars. 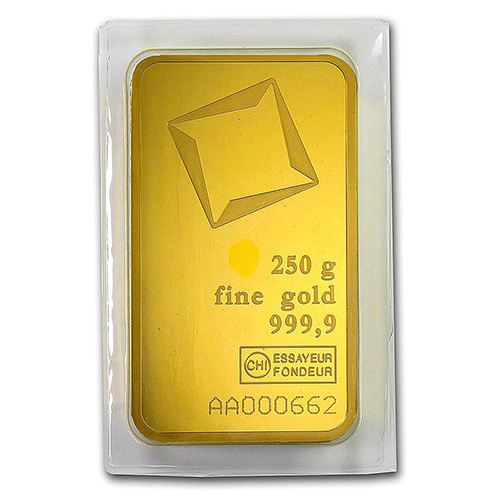 Right now, 250 Gram Valcambi Pressed Gold Bars are available to purchase online from JM Bullion in brand-new condition. Arrives inside of protective plastic with an assay card! Contains 250 Grams (8.037 Troy oz) of .9999 pure gold. Obverse features the logo for Valcambi Suisse and the bars weight and purity. The reverse includes only the name of the refinery. Available for Precious Metals IRAs. Each 250 Gram Valcambi Pressed Gold Bar available to you through this JM Bullion listing is a brand-new product inside of its original packaging. The individual bars are housed inside of protective plastic and come with an assay card included. 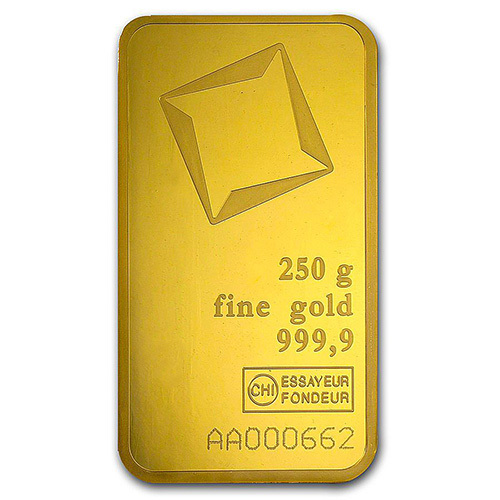 That assay card includes the name of the product type, the metal content, the weight, the purity, and the individual serial number of the bar. 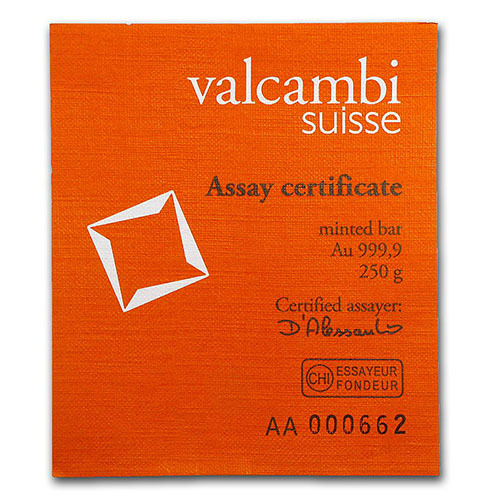 Valcambi Suisse gold bars also feature a serial number on one side that is reflected on the assay card. Valcambi uses a two-letter, six-number digit system to assign unique serial numbers to each of its products. Youll also find an assayers signature on the card included with your purchase. 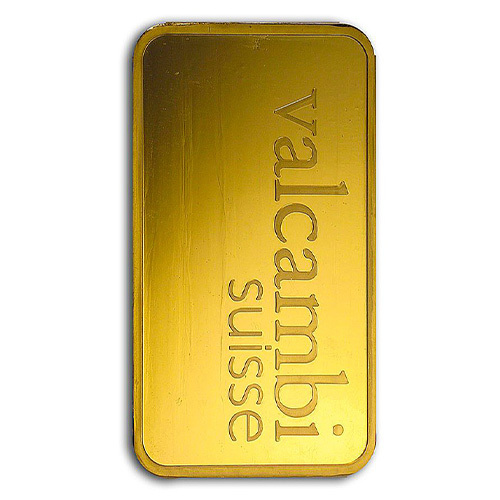 On the obverse side of 250 Gram Valcambi Pressed Gold Bars is the image of the Valcambi logo. This distinct logo is a one-of-a-kind rotating square with a spinning feature to the inside of the square logo. The other engravings on this side of the bar include weight, metal content, purity, assayers marks, and serial number markings. The reverse face of 250 Gram Valcambi Gold Bars features only the simple and beautiful engraving of the refinery name. Set horizontally along the bar when viewed properly, the name reads valcambi suisse. These pressed gold bars are minted ingots with rounded edges and are available as just one of the many weights from Valcambi. Other available weights include 1000 Grams, 500 Grams, and others down to 5, 2.5, and 1 Gram. Valcambi Suisse was originally founded in 1961 as Valori & Cambi by a group of employees and investors with a passion for precious metals. The company has grown and evolved over time, with its most recent change in ownership reflecting the July 2017 purchase of European Gold Refineries Holding SA by Global Gold Refineries Ltd. If you have any questions, please feel free to reach out to JM Bullion. Our customer service team is available to you at 800-276-6508, online using our live chat, and via our email address as well.